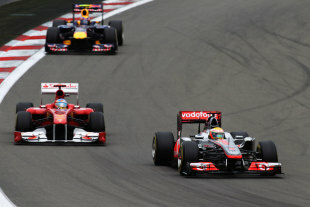 Mark Webber says Red Bull needs to find more race pace from the RB7 if it is to return to the top step of the podium. Red Bull had the dominant car for the first half of the season, with Sebastian Vettel winning six of the first eight races. While that dominance has always been most prominent in qualifying - where Red Bull has secured pole position at every race - the gap is traditionally closer during the races, and the fact that the team has only won one of the last four races shows how the advantage is shrinking. Having started from pole position in Germany on Sunday, Webber could only finish third, and he said it was a clear message to the team that it needs to improve its race performance. "I don't think I could have done much more on Sunday," Webber is quoted by Sporting Life. "I drove to the limit of the car. Of course, I was disappointed not to win, but we know we have to improve the car on Sundays. It's an area that has been brewing the last few races, and it is something we need to try to address soon." As Red Bull could only finish third and fourth at the Nurburgring, Webber said the order in Germany may not necessarily be a sign of things to come, but that its form this year has been based on capitalising on every opportunity. "Is it the form for the second part of the championship? Difficult to say. We're going to go to a track which should be a bit better for us than the Nurburgring. Let's see. Sundays are more of a handful for us at the moment. Fernando was with us in Turkey and Valencia, Lewis in Barcelona, but it's a bit early. "I actually think we were more dominant last year than we are this year. It's just we always put things together and we've always been there at the end. It's just that Seb had a good run, close victories, not winning by 20 seconds." Webber also said that the higher temperatures of Hungary, coupled with a track suited to the RB7 should see a more competitive performance from Red Bull this weekend. "The circuit should suit our car well as we were very strong there last year, and more of the same this year would be good. It's another opportunity for us to get some good points, and it's always nice to finish before the break with a strong result."